Dr.Philippe ARHETS, Counsellor for Science and Technology, French Embassy in India was an Invited Guest and received the first copy of the souvenir on behalf of the French Embassy in India. During his address he emphasized the collaborative activities between India and France. 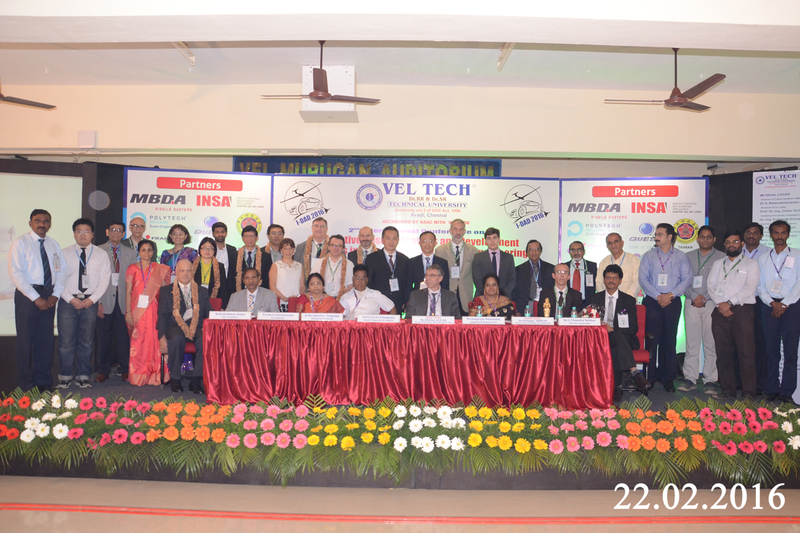 He also highlighted and appreciated the achievement of Vel Tech towards French Collaboration. During the Inauguration, Cooperation Agreement between MBDA Missiles Systems, France and Vel Tech Dr.RR & Dr.SR Technical University was also signed. Both these organizations were closely working for the past five years and every year more than 15 students are undertaking project with the Guidance of MBDA. This agreement was signed for the following areas of cooperation. Contribution from MBDA employees to academic education of Vel Tech students. Commonly monitored graduation projects, both at UG & PG levels. Contribution from MBDA employees to Conferences at Vel Tech. Prof.Beela Satyanarayana, Vice Chancellor welcomed the gathering. Dr.U.Chandrasekha, Pro Vice Chancellor gave an overview of I-DAD 2016. Mrs.R Mahalakshmi Kishore, Chairperson and Managing Trustee delivered Special Address. Col.Prof.Dr.Rangarajan, Founder Chancellor & President presided over the functions. Mrs.Sakunthala Rangarajan ,Vice Chairman was also present. I-DAD is scheduled with 3 Plenary Sessions, 13 Key Note Talk and 2 Invited Talks with 54 Contributed papers. World class scientists and researchers such as Dr V. Balasubramanian (Simpson &Co, India), Prof. Dr.-Ing. Dieter Scholz (Hamburg University of Applied Sciences, Germany), Dr.-Ing. Eckhardt Schneider (Fraunhofer IZFP, Germany), Dr. N. Eswara Prasad (DMSRDE,DRDO, India), Mr. François Falempin (MBDA, France), Prof. Jean Marie CASTELAIN (INSA Centre Val de Loire, France), Dr. D. K. Kharat (Director, ARDE, Pune), Dr.P.A. Lakshmi Narayanan (Simpson &Co, India), Prof.Lanzhu Zhang (East China University of Science and Technology, China), Prof. Lung-Jieh Yang (Tamkang University,Taiwan), Dr.R. 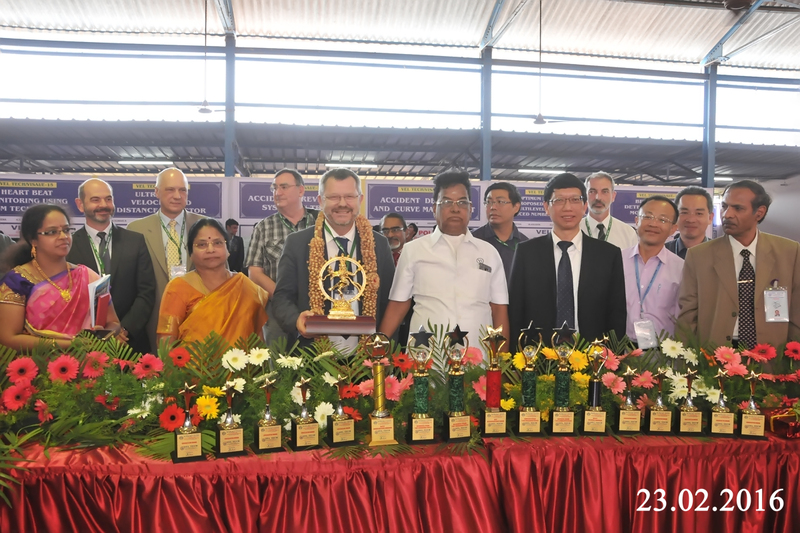 Mahadevan (India Pistons Ltd, India), Prof. Philippe Devinant (POLYTECH ORLEANS – University of Orléans, France), Prof.Dr. Shan-Tung Tu (East China University of Science and Technology, China), Dr. Shankar Venugopal (Cummins India Ltd, India), Dr. Sutthiphong "Spot" Srigrarom (University of Glasgow, Singapore) will be addressing in different sessions. In addition to the above talks, Papers from various renowned orgaisations such as INSA-France, Hamburg University of Applied Sciences-Germany, National Ilan University-Taiwan and research organization from India like DRDO-CVRDE, DRDO-VRDE, ISRO, CSIR-NAL, IITM, IITB, IITkgp, IIT Mandi, MIT Manipal etc., will also be presented. The conference aims to address the issues of collaboration involving academia – industry - R&D labs. Proceedings of the conference will be published by the Springer as Lecture Notes of Mechanical Engineering. VISAI 2016, the 6th International Project Competition and Exhibition is being Organised in parallel. More than 120 projects representing various Institutions across the Country are taking part. Prof. Jean Marie CASTELAIN (INSA Centre Val de Loire, France) Inaugurated the Event and Released the souvenir. More than INR 1,00,000 worth of cash prize to be awarded. Team of Experts representing Research Organisations and Industry are evaluating the Projects.